Today we journey to the Austrian province of Salzkammergut, situated north west of Lake Wolfgang in the small town of St. Gilgen, home to the heritage of musical genius and master composer Wolfgang Amadeus Mozart and scenes from the iconic historical musical movie The Sound of Music the greenery and peace of the never ending hills is absolutely breathtaking! The setting of this dream home in the hills adds to the magical and enchanting atmosphere which surrounds the home, making it an absolute masterpiece structure carefully created by the fantastic Munich-based architecture design team at SilverstrinDesign, who ensured that the exterior and interior of this magnificent home is nothing less than symbiotic and classic! This modern take on a home in the hills would make the perfect place for a revival of the Von Trapp family story, don’t you think? This magical home that takes in the sights and sounds of the surrounding atmosphere so elegantly and effortlessly adds to the beautiful setting of this peaceful and natural landscape in a fantastic way, looking like a modern cottage in the hills. The addition of the glass walls and exposed wooden panels further accentuates the charming exterior aspects of the home, creating a reflection of the environment on the glass and allowing for natural sunlight to flow through the large windows and glass doors throughout the day. The never ending greenery of the surrounding environment adds to the beauty of this home, creating a fascinating setting of elegance, charm and almost rustic country living, but with a twist. This home will be a marvellous sight regardless of whether you are admiring it from the inside or the outside. And it will definitely make the perfect home away from home for those long weekends! 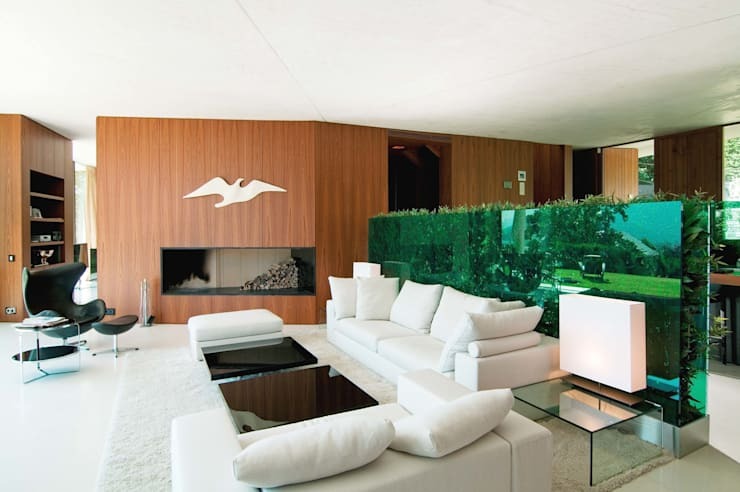 The interior look and feel of the walls in this classic modern home set in the Austrian hills, perfectly mirrors the exterior exposed wooden panels that were used on the walls. The designer pieces added to the living room space create a comfortable and relaxing interior that is both cosy and welcoming. And with the simple use of colour and tones utilised in the inside of this glass walled home, the home will remain tasteful for many years to come. The all-white large and comfortable sofas make the living room look even more comfortable, while the addition of mirror-like coffee tables adds a modern yet monochrome effect in the furniture decor. Adding in an even more uncluttered effect is the large white rug placed on the floor, which almost mirrors the all-white ceiling. The addition of the fantastic built in fireplace will also ensure that the home has a bit of added warmth, especially in those cold and dreary winter months! The simple use of colour in this house, has ensured an almost synergy-like effect throughout the home, and the unassuming yet modern kitchen is not different. Almost monotone in its appearance, the kitchen has an appealing quality and is aesthetically well designed from the neutral tones used in the cabinets and the exposed wooden counter to the fantastic U-shape design element of the kitchen itself. The large elegant window perfectly located in the kitchen allows for ample natural sunlight to create an even more homely effect during the day, while the fantastic breakfast bar idea makes this cooking space family friendly too! The addition of two gas hobs on the counter situated at the breakfast bar makes cooking a social experience too. Now you can entertain your guests while you fix their meal too! For more kitchen inspiration, you might like to check out: 7 Ways To Furnish A Functional Kitchen. 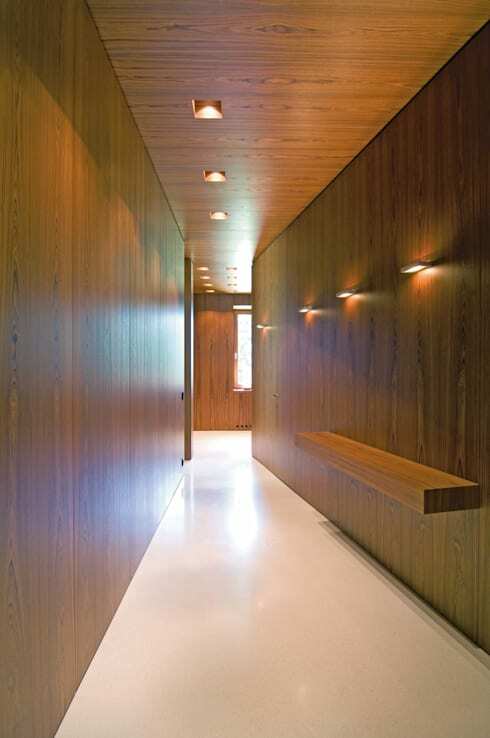 A wooden walled hallway such as this may not be for every one or a choice for every home, but in this wooden clad home, it is an acceptable addition. The walls of this hallway have not allowed a natural sunlight setting to become part of the decor and design. Instead the darker wooden walls creates a luxurious element of elegance and classic style, typical of older more traditional and classic home spaces. The wooden walls in comparison with the all-white seemingly polished floors creates an uncluttered and neat look and feel and is the perfect place to create a fantastic extra storage facility and opportunity, especially when actual bedroom and cupboard storage areas are minimal. The large floor to ceiling wooden walls will perfectly mask the clothing, shoes, bag and accessories that are not needed at that time of the year, making bedroom cupboards uncluttered and appealing as well! 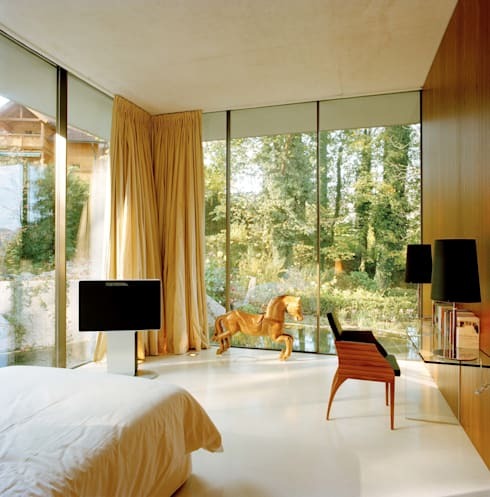 This fantastically bright and airy bedroom creates the perfect safe haven, bringing the outdoor environment indoors too. 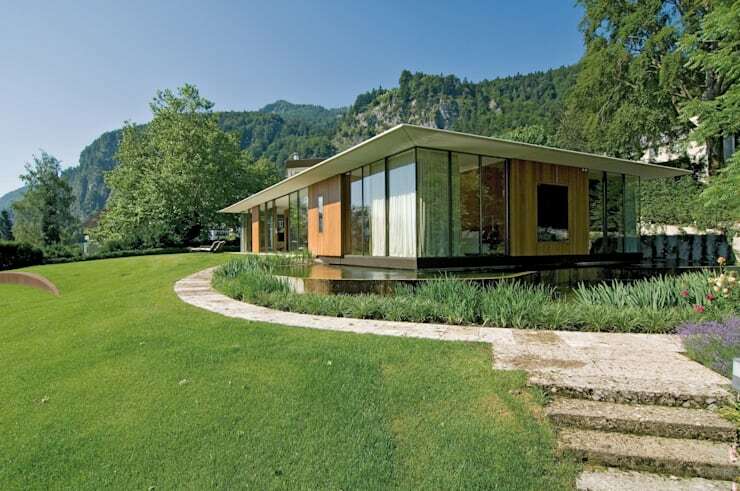 Allowing for natural sunlight to stream in through the floor to ceiling windows and creating a picturesque view of the landscape and magnificently green exterior of stunning terrain and majestic landscape features. The addition of light and bright yet neutral tones to the bedroom space creates a vibrant and modern interior space, while the floor sweeping curtains adds a more luxurious and pleasant effect to the beauty of the room in its entirety. Other modern elements includes the jet black lamp shades that contrast the overall brightness of the room, while the wooden aspect of the wall is visible again in the bedroom space. Adding in another wooden element is the addition of the wooden chair at the minimalist dressing table. A bathroom such as this is perfectly placed in a home that uses so many wooden elements throughout each and every aspect. There is something luxurious about this stunning shower area, making it innately impressive through the merger of transparent glass and wood panels. This home shower space is sure to be luxurious and relaxing, while the fantastic lighting inside the cubicle will ensure that the shower remains a well-illuminated yet tranquil space regardless of the time of day. The atmosphere, decor and design elements that went into making this shower so fabulous is nothing less than creative, vibrant and completely different to any other home shower space. 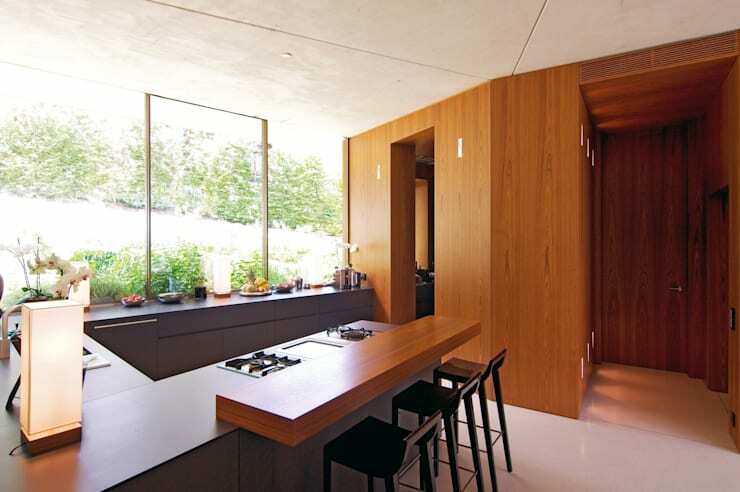 The home owners and architecture team seriously considered a symbiotic relationship between the indoors and outdoors before the home structure and layout was completed. How's this as an ending to our fabulous Austrian home tour? Did you find this wooden home interior appealing?